All orders for the HX-600 are pre-orders, and will be delivered approximately 3 weeks after the date of order. The Hx-600 Hydrogen Gas Machines are user-friendly and strong portable hydrogen gas generators. With a nice handle and sleek style, they are suitable for any room in your home, clinic or hospital. The only really safe method of producing hydrogen gas is using the DuPont SPE/PEM Membrane. The HX machines use DuPont's SPE/PEM Membrane. This membrane removes toxic elements, such as chlorine and ozone, while at the same time produces completely pure hydrogen for either inhaling or producing hydrogen water. The Hx-600 is perfect for two people to use at the same time. It produces pure hydrogen at at a set clinical flow-rate of 180-200 ml/min of H2 flow out of each port. 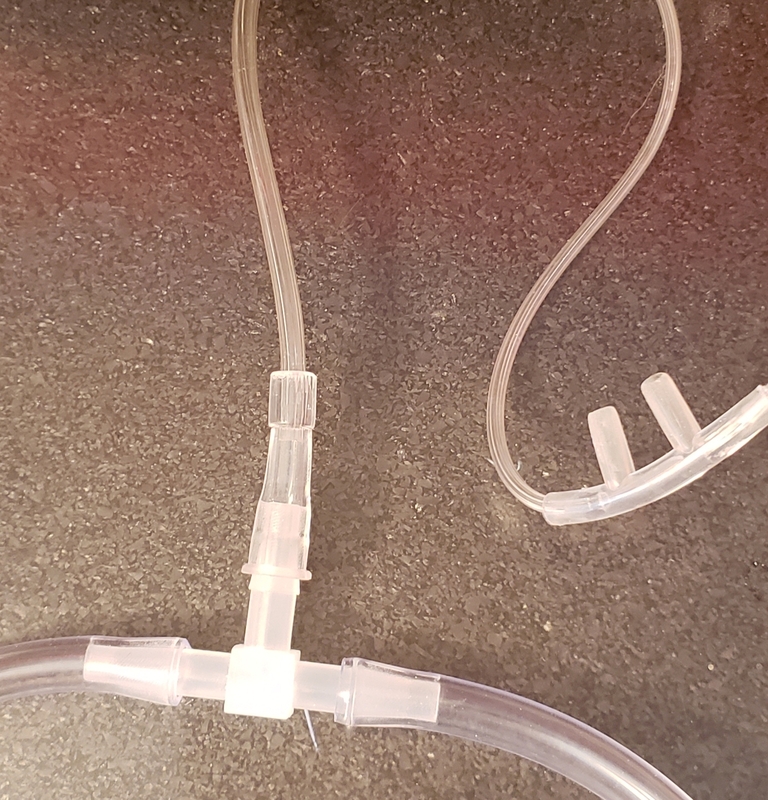 The Hx-600 gives double the strength to a single breather when you combine the flow from both ports into one cannula (using a hose-splitter - see picture below). Up to 4 people can breathe hydrogen gas at a time if you use a hose-splitter on each port. (Note: the output will be less when you divide it into 4 flows, but still should be at beneficial levels for breathing). You can use the HX-600 to produce hydrogen-water (up to 1200 ppb) by dropping the hose in a bottle of water for 5 - 20 minutes (depending on the volume of water). Fill to between the 1600 ml and 2000 ml lines. In the future, if the water level falls below 1600 ml add more of this water to the machine. After about 3 months of regular daily use you will need to change the water in the tank. There is nothing else you should need to change. Do not operate any hydrogen gas machine near an open flame; it could set off sparks and harm the machine. If you are not going to use the machine for months, still leave water in the tank to keep the DuPont membrane moist. All HX hydrogen gas machines are able to work for up to 2 hours at a time (with a one-hour break in-between). If you try to use it more than that it may affect the life of the machine. Put a hose-line (cannula hose or other hosing) on the H2 output port(s) on the front of the machine. If there are 2 ports (as in the Hx-600), then two people can breathe at a time or one can breathe while using the other port to pump hydrogen into a bottle of water for drinking...or any such combination. Three or more cannula hoses come with the HX-300 and HX-600 Hydrogen machines. Don't run these machines without hooking up the hoses and either breathing or immersing them in water. The HX-600 and HX-300 SPE Series Pure Water Hydrogen Generators are powerful. You can expect about 180 lpm of hydrogen to flow from each port. It is advised to breathe for only 20 minutes to one half hour at a time. How many times you breathe is up to you. We know of no bad side-effects from breathing H2 gas, period, however we wouldn't recommend you use it all the time. Just periodic uses throughout the day. The flow rate is pre-set to clinical levels for breathing and non-adjustable. All you need to do is hook up the hoses, turn on the machine and start breathing. Hydrogen starts flowing right away. Push the power button to start the hydrogen flow. When finished, push the power button again to turn the machine off. You don't have to wait for the machine to "warm up". Hydrogen starts flowing immediately. For your safety, the hydrogen gas produced is run through a filter/drying-tube, which reduces it to 99.9999% pure hydrogen produced. The HX machines are very sensitive to the presence of any particulates or minerals in the water. 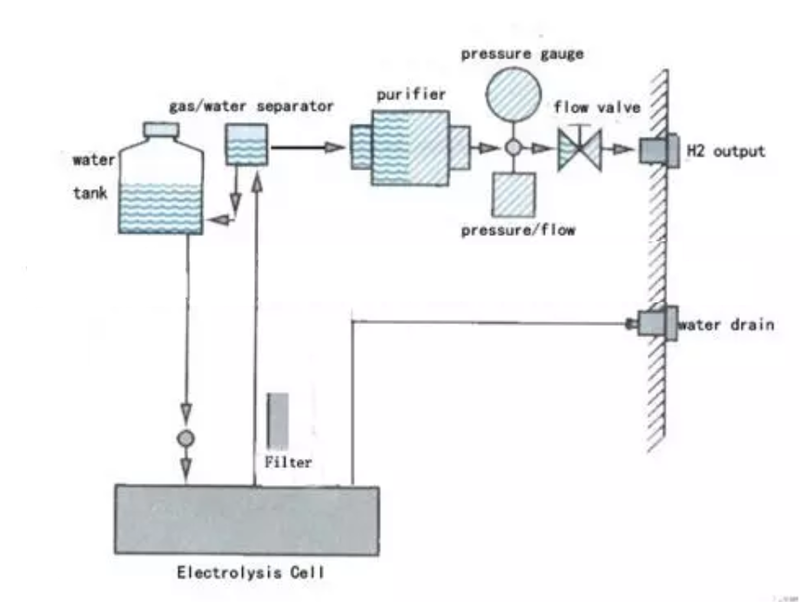 You have to use deionized water in the tank (with a rating of 2 mega ohms or higher) to ensure it's very pure water you are using in the machine. Even then you may need to do a vinegar wash just to keep the flow at the proper levels (180 - 200 lpm). First, pour out all the water of tank using the drain hose. (If it's clean water, you can store it temporarily and put it back in the machine at step 10 if you want. Add about 2 liters of white vinegar into the water tank, and then turn on the switch for a minute or two. Check the flow-rate. If it's going up, that's good. Wait about 20 minutes (with the machine off) and then try steps 2 & 3 again. It should be improving. Repeat the above, until the flow is 180 lpm or higher. If the flow is not increasing well enough, you should leave the white vinegar in the machine overnight (or for 10 hours). Every so often turn on the device for a minute, then turn off the device for a period of time. After the flow is normal, the cleaning is completed. Finally fill the tank to slightly below the 2-liter mark with qualified water (deionized water, which is 2 mega ohms or higher). DuPont SPE/PEM membrane made in USA / Rest of machine made in China.